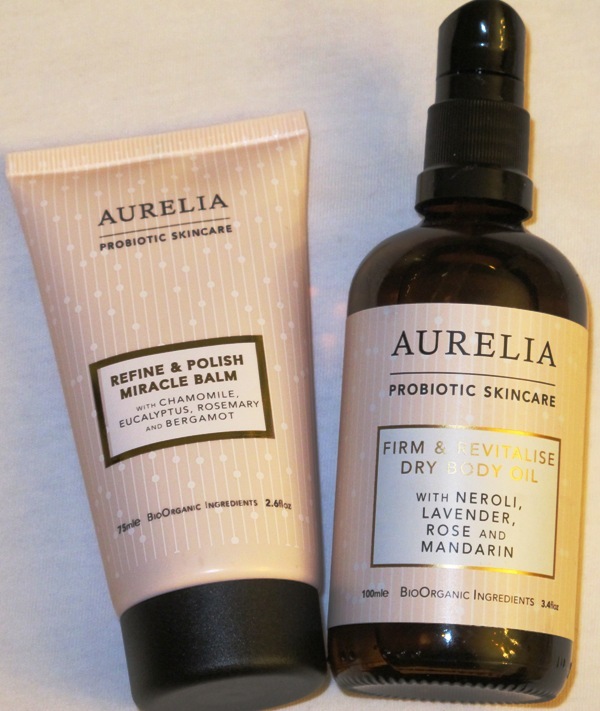 Aurelia probiotic skincare is a favourite of mine not only because each of their products has a unique identity, purpose and smell but also because the team only adds new products when they are completely sure that they will enhance the benefits of the existing products in the range, which brings me right to their two recent launches. Refine & Polish Miracle Balm is a double-action product, for those of us who want effective results without the unnecessary drain on our time. This enzyme polish was developed to brighten a congested, lacklustre complexion with Aurelia’s signature probiotic and peptide complexes helping to balance, as well as protect the skin from environmental aggressors. The balm has BioOrganic oils that emulsify when coming in contact with water in the palm of your hand plus the refining beads that will clear away dead skin cells, boost the circulation and make your skin feel revitalised. After you cleanse your face, pat it dry and then apply a large, pea-sized amount of balm to your skin with the tips of your fingers – be careful to avoid your eyes though. Massage your face with circular motion, from outside in, not forgetting the temples and jawline – don’t be surprised if your skin feels slightly warmer than usual. When you are done with massage, add a few drops of water to your face and the balm will turn into a gentle milk. You have a blend of essential oils of chamomile to calm & sooth, eucalyptus ( anti-bacterial & antiseptic ), rosemary ( it is known to benefit skin conditions like acne due to its anti-bacterial properties ) and bergamot, which os often used as top note in perfumes and is known to help heal scars and address issues of uneven skin pigmentation. Key botanicals in this product include a wonderful fruit called baobab, that has been having a bit of a beauty romance as of late ( due to its potency of vitamin C, its boosting effect on the immunity system and it being rich on Omegas ), Kigelia Africana which helps to smooth and firm the skin, Sugar Maple Sap which accelerates skin’s own exfoliating process and Hibiscus which helps to plump the skin and feeds our skin with anti-oxidants. If you prefer exfoliator to a mask, this balm gives you that option as well – just examine your face in the mirror and decided what it needs most on the day or night in question – the more you personalise your daily skincare routine, the better your skin will look long-term. After cleansing the face, as mentioned above, apply the balm all over your face, avoiding the eye and lip area and let active fruit enzymes exfoliate your face, while you take a shower or a luxurious bath or do your nails. After five minutes, repeat the steps above and enjoy the sense of beautiful rejuvenation, which this clear balm, with tiny white granules, gives to your skin. You can use this balm either in the morning or in the evening, but as our skin rejuvenates and regenerates at night, I tend to do it a couple of times a week in the evening. When you stand in the bathroom, in front of the mirror, it’s just you and the mirror, so savour the ‘me-time’ which every woman needs in order to feel balanced from inside out. A dewy, glowing complexion suits a woman of any age and you don’t have to be 20 to possess it naturally. Ingridients: Caprylic/Capric Triglyceride, Glycerin, Prunus Amygdalus Dulcis (Sweet Almond) Oil, Yogurt Powder, Oryza Sativa (Rice) Bran Wax, Sucrose Laurate, Aqua (Water), Bifida Ferment Lysate, Cetyl Esters, Schinziophyton Rautanenii Kernel Oil, Citrus Aurantium Dulcis (Orange) Fruit Water, Vaccinium Myrtillus Fruit Extract, Olea Europaea (Olive) Fruit Oil, Eucalyptus Globulus Leaf Oil, Rosmarinus Officinalis (Rosemary) Leaf Oil, Sucrose Palmitate, Saccharum Officinarum (Sugar Cane) Extract, Citrus Aurantium Bergamia (Bergamot) Fruit Oil, Citrus Aurantium Dulcis (Orange) Fruit Extract, Citrus Limon (Lemon) Fruit Extract, Anthemis Nobilis Flower Oil, Acer Saccharum (Sugar Maple) Sap Extract, Tocopheryl Acetate, Lactis Proteinum (Milk Protein), Adansonia Digitata Fruit Extract, Hibiscus Sabdariffa Flower Extract, Kigelia Africana Fruit Extract, Benzyl Alcohol, Citric Acid, Lactose, Dehydroacetic Acid, Limonene*, Linalool* (*naturally occurring in essential oil. Firm & Revitalise Dry Body Oil: I was lucky to try this product when it was being developed and had a slight reservation, as it smelled a little strong to me. Don’t get me wrong, a beautiful smell of a flower meadow in the sun is wonderful all year round but personally I tend to favour slightly more subtle body oils. Keeping an open mind leads to amazing journeys of discovery, so when I actually started using this body oil daily a few weeks ago, my reservation went right of the window without looking back. This dry body oil is Aurelia’s first body product ( even though I can vouch for Refine & Polish Miracle Balm being a great product to use on your neck and decolette – after all those areas are one of the first to show signs of ageing ) and its primary aim is to help hydrate and firm the skin, while making you feel feminine with its uplifting flowery aroma. This body oil is a blend of essential oils of Neroli, Lavender, Rose and Mandarin which are combined with Aurelia’s unique antioxidant-rich BioOrganic Botanicals which all together shoo away the stress, revitalize your senses and sooth and pamper your skin & body ( it is wonderfully soothing for the tight muscles as a massage oil after the workout ). One of the wonderful qualities of this body oil is that while it feels abundantly rich, it sinks in very quickly, so you don’t have to linger for too long before getting dressed-whether it is in the morning before running out of the door or in the evening, before going into the land of dreams. Initially the fragrance feels a little rich but within minutes it feels like a comfortable friend against whom you want to lean in. A combination of Macadamia and Borage oils provide your skin with essential fatty acids which help to firm & tone the skin, Mongongo oil provides your skin with Vitamin E which is essential to keep skin nurtured and Kukui oil that assists skin’s repair process and helps to rehydrate your body. On top of that you have the lightest, Kalahari Oil, which makes sure that the oil sinks into your skin without leaving any residue behind, just a beautiful healthy glow. After taking a shower, lightly pat your skin with a towel, leaving some water intentionally on your skin and then spray some oil into the palms of your hands and massage it all over your body, paying particular attention to your elbows, knees, and even feet. Aurelia team recommends applying this oil to your skin during the day or in the evening, before going out, adding a beautiful perfume layer to your personality and a radiant glow to your skin – it re-awakens the skin during cold months or enhances your natural tan during warmer months. You can also add it to your body moisturizer ( make sure the two fragrances compliment each other, as the oil might not work well with a highly perfumed body cream or moisturiser ). I have been a big fan of body oils and recently found out that doyenne of beauty editors Newby Hands is also full of praise for face & body oils, so if you had any reservations about using a body oil, now is the time to let yourself experiment and see how your skin responds, just in time for a summer holiday.